The above info came from Who Wants to Know? and Amy, and was edited by yours truly (contact me). The image came from Who Wants to Know?. Mobile Suit Gundam SEED marks a new leap in the world of Gundam. Like G Gundam and Gundam Wing , Gundam SEED creates an alternate universe with its own set of characters and situations, yet retaining the political conflicts and giant machines that identify a Gundam series. For the first time, however, Gundams comes to life through computer animation. The conflicting sides in Gundam SEED are the Earth Alliance, composed of Naturals (normal human beings), and ZAFT (Zodiac Alliance of Freedom Treaty), an organization that has produced Coordinators (genetically-modified humans). Differences in philosophy combined with struggles for economic resources led to an incident known as "Bloody Valentine", a devastating event that sparked open warfare between the two factions. One year later, a ZAFT forces attack the space station Heliopolis. On the surface a neutral space station, it is really a secret Alliance facility where new mobile suits (Gundams) are being constructed. The raid results in four of the Gundams falling into ZAFT hands. The people-side of the story revolves around Kira Yamato, a Coordinator and a student in an industrial college. He has been reunited with his old friend Athrun Zala. Unfortunately, he soon learns also that Zala his become his enemy. With no one else to turn to, he goes against his race and joins the Alliance, piloting the Alliance's remaining Gundam in an uphill battle while at the same time trying to figure out what is most important in his life: his beliefs, his friends, or justice? This Anime is about a war between the Coordinators and the Naturals. The coordinators are people who at a very primitive state before birth had their genes altered to enhance their abilities (making them smarter, more efficient, and adaptable). The Naturals are the people who are ordinary humans and did not have their genes altered. The Naturals (or the Earth Alliance) fight against the Zaft (or the Coordinators). The war broke out because of differences between the Naturals and the Coordinators, as well as for economic reasons. The characters in this anime are designed with complex and uncertain emotions. Kira Yamato, its leading character is a coordinator fighting alongside the Naturals. He was unwillingly forced into the war after witnessing the classified Gundam. He did not wish to fight, but did anyway because of a feeling to protect his friends. 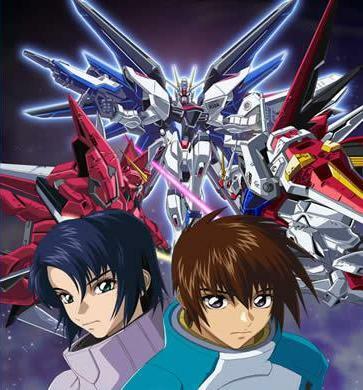 While fighting a Gundam of the enemy, he discovers that he is fighting his childhood friend Athrun Zala. Throughout the anime Kira has many doubts and uncertainties because of his nature and the fact that he's fighting against his own people. The above description came from Kay Sand, and was edited by yours truly (contact me).